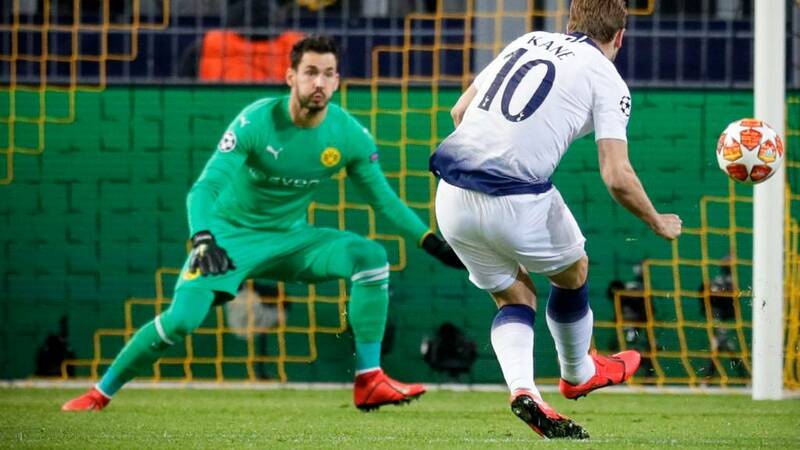 Tottenham won tonight, but if you're just joining us, three-time defending champions Real Madrid have been knocked out of the Champions League by Ajax after being thrashed 4-1 at home. It was their biggest ever margin of defeat in a home knockout game in European competition. Real are the first reigning Champions League winners to fail to qualify for the quarter-final stage since Chelsea in 2012-13. Read the Tottenham match report here. Read the Real report here. Just wait until the summer! There are big big problems at Real. One of the top players, one of the captains at Real, said that they only need to play well for four games a season to win the Champions League. That attitude in the long term is a massive problem. It's the worst defeat at home in their European history. There was resignation from the fans, they just went home without making any noise. They cannot compete in the market like they used to, they stopped getting Galacticos in 2014 and the squad is thinner and thinner. Who would you say is a superstar in this team? Everyone has disappointed. Gareth Bale did not start which is frustrating him big time but they do not see him as one of them. When he has been given the responsibility he hasn't shone but he won't shine if he's only given 15 or 20 minutes. It's a truly seismic result in terms of European football and possibly the end of an era. This Real team have won four of the last five Champions League and they have been humiliated on their own pitch. End of an era for Real? After their results, knowing they're not going to win the league and going out of the Copa del Rey, Real Madrid needed a result tonight but they have been well and truly beaten. It should have been more, you've got to give lots of praise to Ajax, but I think a lot of people will know be looking to see what's going to change at Real Madrid. It's probably the end of an era. They've been so good over the years but Cristiano Ronaldo left in the summer and now you might see Luka Modric or Toni Kroos leave. I don't know if you'd put Sergio Ramos in that position but it wouldn't surprise me if there was a complete change at Real Madrid. Real Madrid boss Santiago Solari: "It's still a painful week, the fans have been spectacular, they've been supporting a difficult moment, they have not caught up with us. "They are three times European champions, today we have been eliminated, it is a very sad moment and it puts in context what they have done before, it is very difficult to win. "Without talking bad about any player, of course we missed the captain. "Madrid always comes back and always comes back stronger." Ajax coach Erik ten Hag: "This was pretty close to perfection. Over the two matches we definitely deserve to progress to the next round. I enjoyed watching my team immensely this evening. What a start for Phil Neville's side! They are 2-0 up already. You can follow and watch here. Real Madrid defender Nacho - who was sent off: “We’re devastated. It’s very complicated. We’re not used to being at this stage of a season with practically no title left to play for. Spurs fans, you've got a bit of a wait. The draw for the Champions League quarter finals takes place on 15 March. Tottenham can play different systems and I think it's great when you've got that. They can change, they've got quality players who understand the game. People will say Tottenham are not going to win the Champions League but you never know. You don't know whether the draw's going to be kind, and if they can play the way they can play, they can go a long way. If Paris St-Germain, Barcelona and Man City go through, I would put them as favourites above Tottenham. But Tottenham have got some good young players and they're waiting on Dele Alli to come back as well so I think they could finish strong. Just a reminder of how things looked for Tottenham halfway through the group stage after drawing 2-2 at PSV Eindhoven. Mauricio Pochettino said that his side's chances of reaching the knockout stages were "nearly over". Now look at them! Ajax forward Dusan Tadic: "This is probably the best game of football I’ve ever played. We beat the best club in the world. "Our top three clubs (in the Netherlands) every year lose all their best players. "It is something we cannot stop. "Marc Overmars, the technical director of Ajax, the former Arsenal winger, was explaining today that Gareth Bale, on his own, has exactly the same in wage package per season as the entire Ajax squad. "Well that really sums it up, it just means that the players go for a bigger package." Real Madrid defender Dani Carvajal: "I do not see the end of the cycle, we have a young team and the margin for improvement is enormous, we have to face and not hide, we have had a #'$£@## season." "We are in the quarter-finals. I'm so happy for the players, and the fans. It's an important victory. Of course we suffered a bit but it's ok and we fully deserved to be to be in the quarter-final. "Hugo Lloris was great. We conceded more chances than we expected but that's football. After losing in the first leg they had nothing to lose. "It's tough but overall, the objective was to be in the quarter-final and we are there. "In the last 10 minutes of the first half it was difficult for us. They started to play a little but more and then in the first action when we were able to connect we managed to score the goal. "Now it's about enjoying that we are in the quarter-final. We need to feel proud. The experience is so important to improve and get better. There's a lot of things we can take from this type of game to make us a better team." Girona, Alaves, CSKA Moscow, Levante, Real Sociedad, Leganes, Eibar, Ajax, Barça, Atleti have all beaten Real Madrid this season. They're clearly not a very good team. Question is...why? Players? Coach? Attitude? Combination of the above? Real Madrid are a lot of goals down on last season and that's because of Cristiano Ronaldo's exit but I still don't think you expect to go to the Bernabeu and win the way teams are doing it at the moment. 'The Galacticos' title Real Madrid had is not there at the moment, that's for sure, but they've got a really strong president and they're a massive club, so I'm sure they're already thinking about how they rebuild and get back to where they've been. Now can Man Utd do to Paris St-Germain what Ajax have just done to Real Madrid? Football, football, football. It never stops. England can win the trophy tonight by beating Japan - and you can watch it here.